Student Success, Operational Excellence, Financial Solvency, Academic Quality, and Relationship Development. Hardrick identified these as key areas that will drive FMU’s success into the future. President Hardrick earned the permanent post after serving as interim president since July 2018. An HBCU alumnus, Hardrick earned a bachelor’s degree in Sociology from the University of Louisiana at Lafayette; a master’s in Education in Counseling from Prairie View A&M University; and a doctorate in Educational Administration from Baylor University. 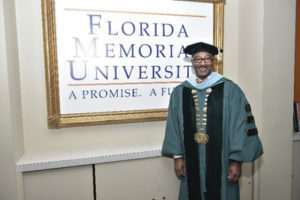 He is a member of Alpha Phi Alpha Fraternity, Inc., Sigma Pi Phi Fraternity, Inc., 100 Black Men of America, Inc., a board member of the Florida Education Fund, Inc., and is an active participant in several other organizations. His scholarship has been published in the Association of Public and Land-Grant Universities, Association of American Colleges and Universities. He is also co-author of Making Global Learning Universal: Promoting Inclusion and Success for All Students (Stylus). Hardrick expressed that he is honored and excited about the new direction of Florida Memorial.